Easy and ultra stylish cape with collar, knitted sideways in garter st with short row shaping. 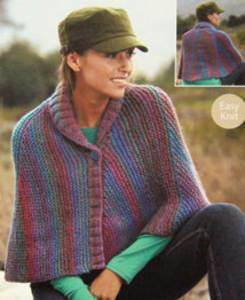 Shown in Sirdar Escape chunky, one size to fit average woman. Cardigan in slip st pattern shown in Sirdar Freya Chunky yarn, fits girls and women 61-117 cm (24-46in). Easy knit boxy jacket with shawl collar and contrast trellis pattern shown in Sirdar Click Chunky. Includes larger sizes 81-137cm (32-54in). 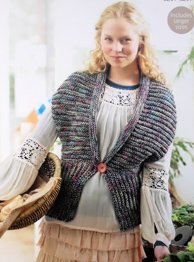 V neck lacy waistcoat in 2 lengths has garter st yoke and single button fastening, shown in Sirdar Click Chunky. To fit women and girls 61-117cm (24-46in). Raglan sweater with cable panel front has round or rolled neckline. Shown in Sirdar Click Chunky to fit women and girls 61-117cm (24-46in). King Cole 3302. 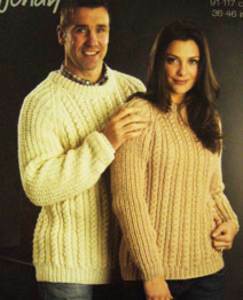 Chunky knitting pattern for sweater and tunic to fit 81-117cm / 32-46ins and a cushion cover. Suitable for any King Cole chunky yarn. Classic V neck cardigan in broad with raglan sleeves, shown in Merino Chunky and Mode Chunky from Wendy. To fit men and women 81-112cm (32-44in). 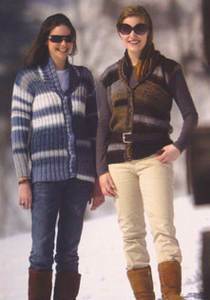 Sweater with shaped ribbed yoke and buttons shown in Twilley's Freedom chunky pure wool. To fit 76-122cm (32-48in). Sweater with lacy textured diamond pattern (20 row repeat) has roll neck or round neck. 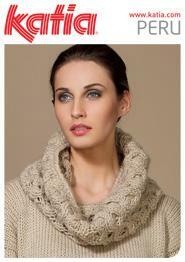 Shown in Sirdar Click Chunky, to fit 81-107cm (32-42in). Waistcoat in double moss st has ridged edging, shown in Sirdar Click Chunky. Includes larger sizes, 81-137cm (32-54in). 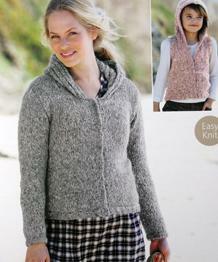 Easy to knit jacket with broad rib asymmetrical front panel shown in Sirdar Click Chunky. Includes larger sizes 81 to 137 cm, 32 to 54in. Interesting construction creates a striking cardigan and waistcoat with back knitted sideways joining the fronts at an angle, in rib variation. 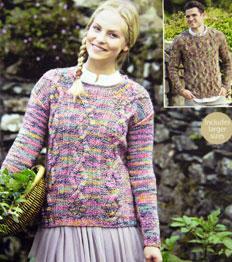 Shown in Sirdar Folksong Chunky, includes larger sizes 81-137cm (32-54in). 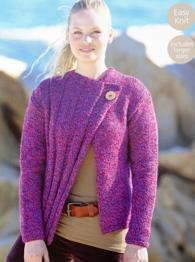 Jacket in reverse st st in 2 lengths has half sleeves, pockets and ridged borders, shown in Sirdar Folksong chunky. Includes larger sizes 81-137cm (32-54in). Sweater with diamond cable panels front and back has plain or cabled sleeves and round or rolled edge collar, shown in Sirdar Folksong Chunky. To fit women or men 81-137cm (32-54in). 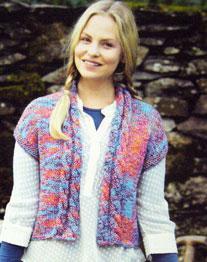 Waistcoat with double cable edging shown in Sirdar Folksong chunky. Includes larger sizes 81-137cm (32-54in). 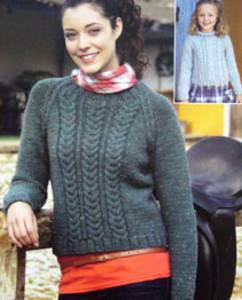 Polo neck or round neck sweater with cluster st panels shown in Sirdar Folksong Chunky. To fit girls and women 61-117cm (24-46in). 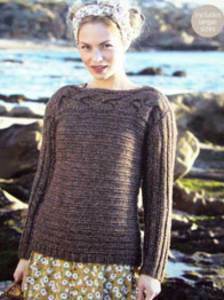 Sweater with stand-up collar and overlong back has cable panels, shown in Sirdar Folksong Chunky. Includes larger sizes 81-137cm (32-54in). 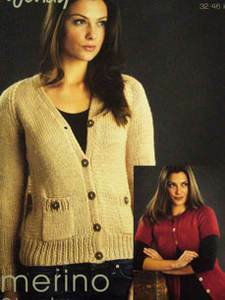 Sweater with garter st ridge pattern and broad rib sleeves has cable yoke knitted lengthways and sewn on, shown in Sirdar Softspun Chunky. Includes larger sizes, 81-137cm (32-54in). Easy garter st cardigan with V neck or shawl collar, shown in Sirdar Softspun Chunky. Includes larger sizes, 81-137cm (32-54in). 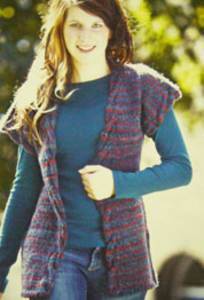 Sleeveless waistcoat with buttoned bodice and top with rolled fold over collar, shown in Sirdar Folksong Chunky. Includes larger sizes, 81-137cm (32-54in). Sweater with cable bodice and basketweave panels in contrast colours is an interesting make, shown in Sirdar Softspun Chunky. To fit 81- 107cm (32-42in). Sweater with deep V has striped and short row panel back and front in garter st and st st sleeves, shown in Sirdar Softspun Chunky. Includes larger sizes 81-137cm (32-54in). Wendy long ribbed cardigan and waistcoat to fit sizes 81-102cm (32-40 ins). In chunky weight, 16st/20rows to 10cm on 5.5mm needles. 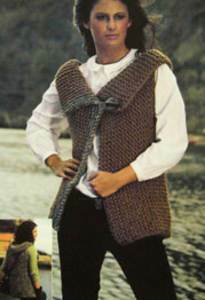 Waistcoat with collar knitted sideways in one piece, with optional contrast trim, in megachunky Wendy Pampas. To fit 81-107cm (32-42in). 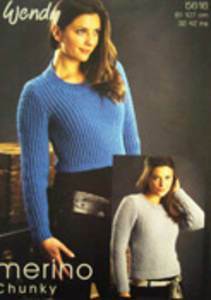 Fitted sweater, cropped or below waist, in twisted rib st, shown in Wendy Merino Chunky. To fit 81-107cm (32-42in). Sweater with cable pattern for men or women has brioche rib sleeves and folded collar, shown in Wendy Merino Chunky. To fit 91-117cm (36 -46in). 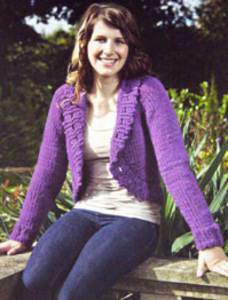 V neck cardigan with long sleeves and pockets or round neck with short sleeves, shown in Wendy Merino Chunky. To fit 81-117cm (32-46in). Lacy V neck top in simple 6 row repeat eyelet st has deep ribbing, plus short sleeved shrug with rolled collar, shown in Wendy Cotton Supreme Chunky. Top fits 81-107cm (32-42in), shrug 81-12cm (32-40in). Lacy top in simple 6 row repeat wrapped st, sleeveless with slash neck or with V neck and cap sleeves, is a perfect summer knit in Wendy Cotton Supreme Chunky. To fit 81-102cm (32-40in). Classic relaxed fit chunky sweater with polo or crew neck, plus hat and boot trims, shown in Wendy Celtic Chunky. To fit men and women 81-112cm (32-44in). 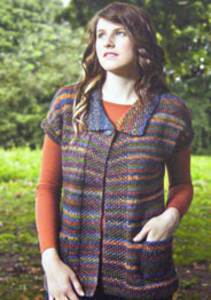 Casual waistcoat with cable edging, shown in Twilley's Freedom chunky pure wool. To fit 81-107cm (32-42in). 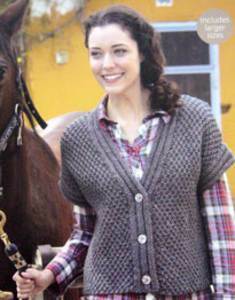 Cardigan in superchunky yarn has garter st ridge and garter st edging and 3 buttons. To fit 81-107cm (32-42in). Cardigan with integral cap sleeves and single button has moss st collar, pockets and borders. Shown in Twilleys Freedom Spirit Chunky, to fit 81-107cm (32-42in). 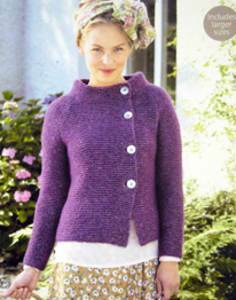 Curved edge cardigan with picot lace border shown in superchunky Twilley's Freedom Wool. To fit 81-107cm (32-42in). Easy jacket with single button can be knitted with contrast border or in one colour. Includes larger sizes 81-137cm (32-54in). Tension 14sts/19 rows to 10cm, 5.5mm needles.